Ouch, My Legs! | the writings of sylvia a. She grabs her usual cup of coffee and a half slice of an everything bagel filled with plain cream cheese to prepare for the most intense tryout of the year: Towson University Poms Squad. It is just another beautiful September Saturday morning for any other college student, except for Kaitlin Wynne. After taking over an hour to prepare for her appearance, she enters at exactly 11:49 a.m. in Burdick Gym 3 as another candidate, not a veteran. Her dark, brown curls reach down to half of her back while she is signing in for the first round. Wearing a white tank top with a black sports bra underneath and tight black shorts, she carries her tan size 6 jazz shoes in hand along with a smile to start the beginning of what happens to be her last season. Kaitlin Wynne, a 20-year-old Towson University student with a 3.9 GPA majoring in graphic design taking a full class load of 15 credits this semester has to not only balance her academic life, but her athletic life as well. Most college students are expected to focus on schoolwork and maintain a balance with their social life; this Towson University dancer has a completely different routine that requires demanding skill, effort, and time commitment. As a 3-year veteran on the Towson University Poms Squad, she is hoping to make it for her fourth and final year on the 2014-2015 squad. 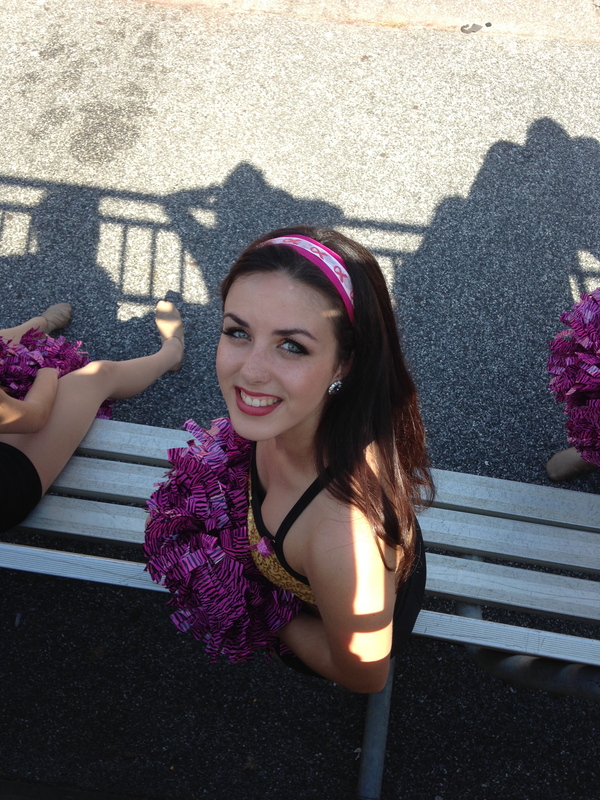 Kaitlin is one of the only three seniors that will be returning to try out for the Towson Poms Squad this season. After starting off as a ballet dancer to later being a member of the color guard at Northwest High School her freshman year, Kaitlin later found her love of dance her sophomore year of high school by being a part of the Northwest Jaguars Poms Squad. “Once I tried out, I just knew that performing in front of an audience; It’s what I loved to do,” explains Kaitlin. Looking back, Kaitlin believes poms requires a lot more than just any other dance team. With a different routine to memorize every week, the Poms Squad practice every Tuesday nights from 8:30 p.m. – 10 p.m. and Wednesday nights from 7:30 p.m. – 10 p.m. at the Towson Center. Although the poms squad is demanding in one aspect, so are her courses that she is taking for graphic design as they take a lot of outside time and work to complete. Apart from practicing and performing at games, Kaitlin is also required to volunteer at different community service functions around the Towson area with the squad. These community service functions add additional commitments in addition to her coursework and having to manage her time. The Towson University Poms Squad is required to appear, perform, and support all Towson University home football games at Unitas Stadium during the Fall along with all home Women’s and Men’s basketball games in the SECU Arena during the Winter. There are many different ways that people will relieve their stress whether it is running, lifting weights, or any other activity. Kaitlin finds that Poms can relieve stress, get her mind off of things, and give her a break from reality for just a second.